As I've mentioned in my previous minimalism video (and post), I've been embarking on the minimalism journey to simplify my life (and to do something about my anxiety). One of the books that has impacted me is The Life-Changing Magic of Tidying Up by Marie Kondo. Marie Kondo created a decluttering system to help you tidy up your home... and keep it that way. I've been implementing the techniques in her book, as I work on my own clutter. Here are some of the things that I've learned on how to tidy the KonMari way. Here's a checklist of the order of the categories she suggests in the book. 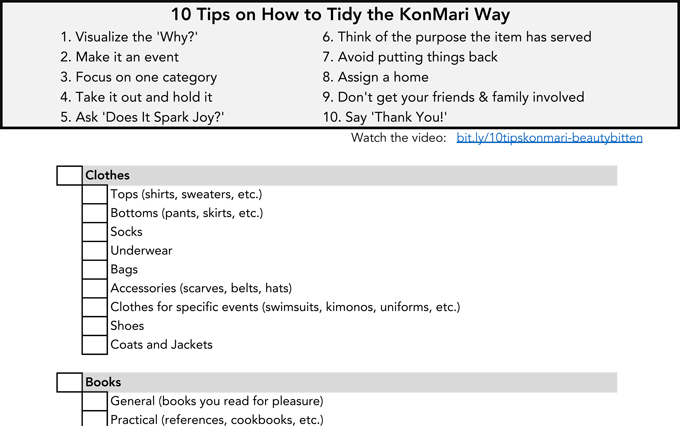 You can download a copy of the full KonMari Tidy Checklist by clicking this link. On the comments below, please share your answer for one of the questions below. I'd love to hear what you think! What would you do with the extra time and space in your life? What's the one valuable tip you've learned while decluttering that you'd pass on to someone?